“Tim was very responsive from the time of my first inquiry right though until job completion. “In a word, outstanding from start to finish. On Top Roofing was one of three roofing contractors I contacted to replace the roof on our approximately 2400 sq. ft. Colonial style home. Tim Womer/On Top Roofing returned my initial phone call promptly and scheduled a convenient time to come to our home to inspect the roof and give an estimate. He arrived at the scheduled time and began with a thorough inspection of the roof and chimney. He took the time to explain the condition of the roof and suggested alternatives to replacing the entire roof. We elected to replace versus repair the roof. He went into his truck and within approximately 15 minutes provided us with a detailed, computer generated printout estimate of all the work to be provided. He also took the time to answer all our additional questions and told us to call him if we had any other questions. Tim and his team were prompt, professional and extremely courteous throughout the entire job. They worked diligently and quickly. They took extra precautions to ensure all the debris was disposed of properly and the job site was meticulously maintained. “Tim Womer from On Top came to give me an estimate for a complete roof job, soffit venting, chimney work, and gutters. Since I have multiple jobs to be done, I have had about 10 contractor come. He was, by far, the best person to work with from all of people I have had come out. I found out as he was leaving (because I asked him about the rest of his day) that he actually had a lot to do, but I never knew it from the time he was willing to spend with me. He made sure that I understood everything he was telling me about. He offered options that others had not mentioned to me and provided a website link that helped me to verify the validity of one of them that I was uncertain about. He didn’t assume that the chimney problems meant and rebuild from the roof up, but carefully checked it out first. It ended up being that it does need to be rebuilt, but I pretty much knew that already. He actually printed out a computer copy of the quote from his truck before he left. (I didn’t have to worry about deciphering a contractor’s handwriting on a hand-written copy.) He was patient with my questions, including a phone call the next day and an e-mail or two. He also revised the quote a couple of times because of changes I made or decisions I made on options he listed. I’ve been very pleased with his work so far. I have chosen On Top Roofing to do the work both because of Tim and because his quote was on the lower end of the estimates I was getting. (Because I am paying for this work as part of a refinancing of the house, we have to wait until after I close on the refinance, so the work is tentatively scheduled for mid September. There was no problem holding the quote that long.) A bonus was that On Top uses two different brands of shingles so there were more options of colors and styles. He told me that his crews do not do gutters, but that he has a contractor that does them for him. He said that he doesn’t make money on gutters but only charges what his contractor does. I chose not to have On Top do the gutters because I found them much cheaper through a contractor that only does gutters. His gutter quote was $1,608, which I found a little high, but still in range with many other quotes. However, I found a local gutter company that would do it for a lot less, partly because they chose to discount their price since the gutters would already be off the house due to the soffit work. 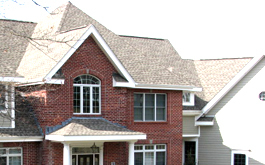 “Tim and his company, On Top Roofing, definitely went the extra mile for us. We had damage to our roof caused by tree limbs that fell on it during the October 2011 storm. The original adjuster that our insurance company sent only inspected the roof from the ground and we were only given enough money to replace a few damaged shingles. Tim (of On Top Roofing) did a thorough inspection of the roof and found quite a bit of damage to the roof. He provided an estimate and advised us that the entire roof needed to be replaced because of the extensive damage and the impossibility of matching new shingles with the old. He advised that we talk with our insurance agent to get another (roof expert) adjuster to come-out and look at the roof. The insurance company sent a roof expert to take a look at our roof – and Tim came to our house to meet the adjuster and discuss the damage. The second adjuster did a thorough inspection of the roof and agreed with Tim that roof need to be replaced. Tim dropped off sample roof tiles, so we could pick out the color and style of the new shingles. He and his crew showed-up on the agreed upon day and finished the roof quickly (two days). They did a good job cleaning up. He he came back a few days later to walk us through his work and make sure there was nothing left to finish up. And, he was good with returning calls and communicated well. “The job went great. Tim and his crew were great to work with. They explained in great detail what the process involved and made sure everything was completed as promised. They even helped us with some problems we were having with a window that was leaking and didn’t charge us a penny. “I really was impressed with Tim and his guys from start to finish. When Tim came to give me a quote, he was thorough with his inspection of the house, answered all my questions and made me feel very at ease. He came back within a day and handed me a very detailed quote and again answered any questions i might have. I ended up not calling him for about 3 weeks to arrange a date to get the house started. He stuck to the quote given, even though the cost of the supplies had gone up a little. They arrived on the day they said they would, and went right to work. they got the whole house done, including the re-leading of the chimneys, the flashing and eaves back up in three days. The cleanup was wonderful and they actually left the yard in better shape than when they got there. Even my neighbors were impressed with their professionalism and cleanliness and are planning on using them for a painting project next year. “On Top Roofing” did an excellent job. I had the roof done on my parents house & they were very respectful & kept me informed of all major events. I would highly recommend them for anyone needing roof work. “In general, the workmanship was excellent. No problems with them. They did what they said they’d do, showed up when they said they would. I have no complaints. They were very professional and exactly what I needed. The were reasonably priced.